Curing of Concrete - Its Methods, Time, & Requirements. Objects of Curing of Concrete. 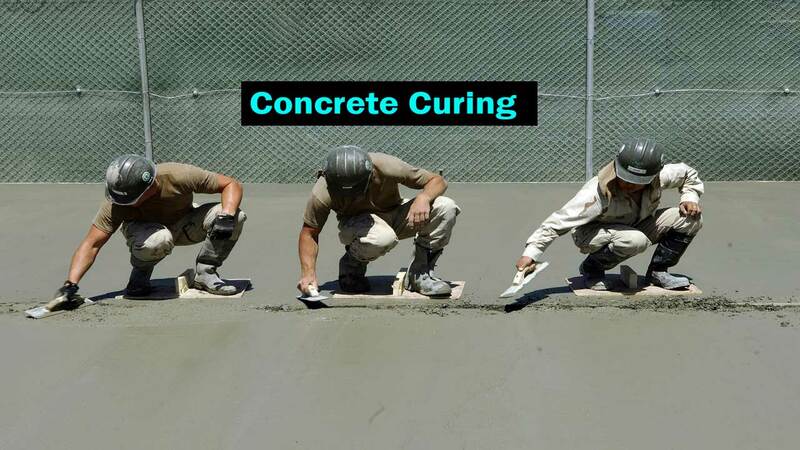 Methods of Curing of Concrete. Right Time for curing of concrete. (2) Intermediate Curing of Concrete. Curing of concrete is the term used for the job of keeping the fresh concrete wet till the desired purpose is achieved. Cement concrete has to be kept wet for few days after its placing to ensure complete setting and hardening of cement. It is known that all the properties of good concrete are related to the perfect setting of cement. It is also known that the process of setting involves complex hydration reactions which require a lot of water. A good quantity of water is added to the concrete ingredients while making the mix. After placing the concrete, some water from concrete may be lost due to evaporation. Hence, the first and foremost object of curing of concrete is to provide enough quantity of water for the cement to hydrate and set completely. Another object of curing concrete is to maintain a proper temperature in and around the concrete during the setting process. This is because both freezing and drying temperatures hamper the process of setting of cement in a normal manner. The third and most important object of concrete curing is to ensure a concrete of good quality, when set, strong enough to stresses, hard enough to abrasion and resistant to chemical attacks. Such concrete is quite durable. Different methods or procedures have been adopted for curing of concrete. FOLLOWING ARE SOME IMPORTANT POINTS FOR SELECTING METHODS OF CONCRETE CURING. (i) The type of construction such as those involving large horizontal surface areas as in roads, floors, and airfields, or, those involving formed concrete in walls, columns, beams, cantilevers, and arches, etc. (ii) The place of construction whether indoors and damp situations (as inside a building) or outdoor. (iii) The weather conditions where concrete is being laid in cold climates or at the dry and hot weather. Depending on above factors, one or more of the following methods are used for curing of concrete. This method is ideally suited for almost all types of construction in most conditions. It involves spraying water with the help of house pipes connected to main water supply lines. Its disadvantage lies that in tall structures, water spraying at top levels may hamper work on the lower floors. It is the next common method of curing of concrete suited best for horizontal surface areas such as roads, floors, and slabs. Small ponds, not more than 5 cm deep are made over the surface by raising temporary barriers. These ponds are kept filled with water for a number of days. In hot weather, ponding is the ideal method of curing of concrete. It is another method of concrete curing suitable for flat surfaces and also for columnar and vertical surfaces after the form work is removed from them. In this method, coverings made of straw, burlap, hessian and jute are soaked in water and placed over the concrete. These are kept moist for the entire period of curing. They are thought to be double-action; they prevent the evaporation from within the concrete and supply the additional water required for hydration. This may be broadly described as the chemical method of curing of concrete. In this method, some suitable chemical compounds dissolved in solvents are sprayed over the fresh concrete to be cured. The solvent evaporates leaving behind a thin film of the chemical compound spread over the concrete surface. This film has the characteristic property that it allows little or no evaporation from the concrete. Thus, if sufficient quantity of water has already been added at the time of preparation of concrete, it will hydrate and set and harden satisfactorily without much additional water. The thick film of chemical compound starts peeling off after some time (2-4 weeks) leaving behind the properly cured concrete. Most curing compounds consist of different types of resins. A major disadvantage of this method of curing of concrete is that continuous concreting is not possible. The cured surface will not make a firm band with the new layer or thickness unless it is completely peeled off or removed from it. Still, on flat surfaces of single thickness, the membrane method is used extensively in concrete constructions. This varies with the type of construction and place of construction and the type of cement used in concrete. Normally, curing of ordinary Portland Cement concrete may take a minimum of 7 days after placement. 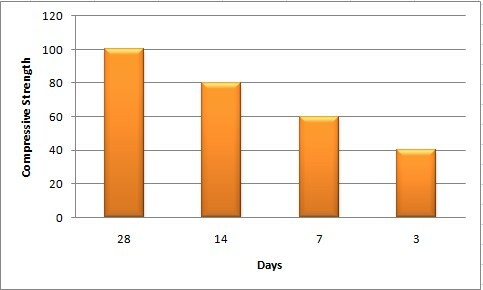 On average curing for 7 to 14 days gives better results in terms of achieving the objectives. If you do curing of concrete for a longer time, there are more chances of better strength of the structure and vice versa. The following graph shows that how the curing duration affects the compressive strength. Longer periods of curing of concrete are recommended for exposed surfaces to obtain a uniform finish in the concrete work. (1) The type of structure. (2) The type of cement used. (4) The type of concrete grade. (5) and on the size of the structure. The right time of curing of concrete depends on several factors. Like, temperature, evaporation rate, moisture content in the air, etc. According to ACI-308 (American Concrete Institute), three phases of concrete curing should be done. This process is also called Bleeding of Concrete. After placing of concrete, the water starts bleeding from concrete and rises from its pores. After rising of water evaporation take place. And the water starts disappearing from the surface due to evaporation. Bleeding of concrete depends on many factors like thickness, length, temperature, etc. So, to reduce the loss of water and prevent shrinkage, initial curing of concrete is required. Evaporation reducers can be used for this process. This process is done when finishing work is finished before the final setting of cement. As you know that, water plays an important role in the strength of concrete. Therefore, intermediate curing of concrete is required. After the final setting of concrete, it should be cured so that to prevent loss of more water and increase the strength of concrete.